worked in the world the will of the Lord. the ornaments of the earth. The phrase 'Winter's Day' doesn't occur elsewhere with this precise meaning, but November 7 is dated as the first day of winter by the best Anglo-Saxon authorities on the calendar: Bede in his De Temporum Ratione and Byrhtferth in his Enchiridion. According to their reckoning winter has 92 days and runs from 7 November to 6 February, which means that midwinter falls around the time of the solstice - as you would expect, so that the turn of the year occurs at the midpoint of the season. 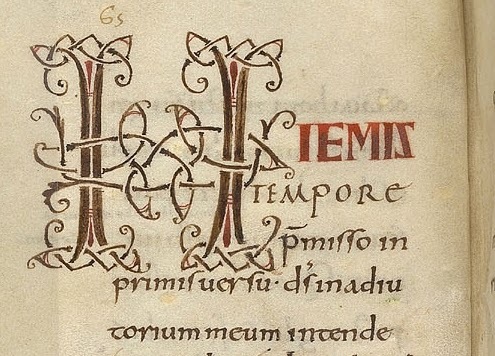 (In recent years it has become popular to say that winter begins on the winter solstice; Bede would not be impressed...) There are of course lots of ways of dating such changes, and early medieval practice varied; but Bede took his dating from Roman authorities and explored its theological significance, and in this, as in many other matters, his opinion was very influential. 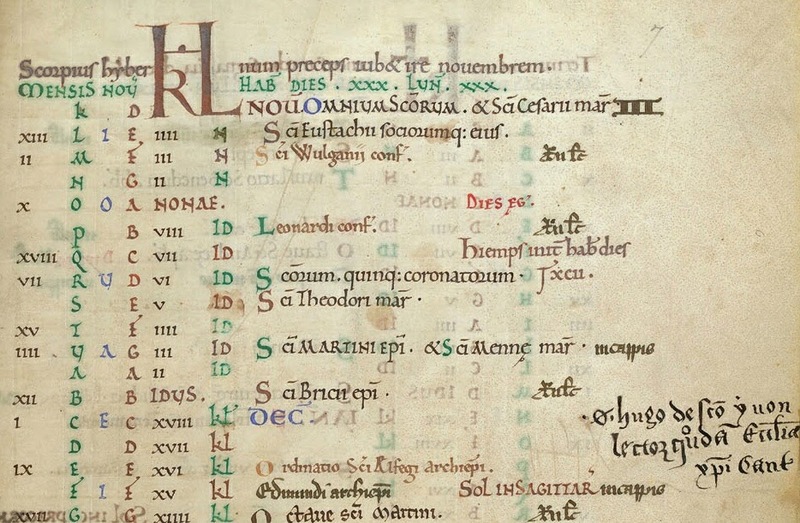 As a result, many later Anglo-Saxon calendars mark the beginning of spring, summer, autumn and winter on 7 February, 9 May, 7 August and 7 November. These are cross-quarter days, which fall halfway between the solstices and equinoxes. In its description of 'Winter's Day' the Menologium is following in this learned, scientific tradition, but it's also drawing on a conventional topos of Old English poetry: the threat of winter. This is a poem which finds beauty in almost everything about the turning year; in its formulaic phrases, every month is ‘ornamented’ or ‘adorned’ or ‘distinguished’ by the features and feasts it contains, and in past posts on this poem we’ve seen the exuberance of spring, the brightness of summer, the plenty of autumn. But there’s no such lingering on the beauty of winter; all the beauty belongs to what's lost when winter takes hold. We have a last glimpse of the loveliness of the abundant harvest, sigelbeortne hærfest, 'sun-bright autumn'. Then winter seizes it (the verb is a violent one, genimð ‘plucks, snatches’) with its army of frost and snow, and captures the earth for another year. Winter comes in like an invading warrior and puts autumn in chains, and the green fields which decorate the earth are permitted to stay with us no longer. There's a melancholy contrast between the two similar-sounding words frætuwe and gefeterad – between the green summer fields adorned (‘fretted’) with beauty, and the winter fetters of frost. þam þe him lyt hafað leofra geholena. conceal his heart, whatever he may think. nor the troubled heart provide help. for him who has few beloved friends. a frozen spirit, not the glory of the earth. In this poem winter infects you, it gets into your heart: the speaker describes himself as wintercearig, 'winter-sorrowful', perhaps 'as desolate as winter', and he has a 'frozen spirit', ferðloca freorig. This is a painful, claustrophobic kind of enclosure; the earth is trapped beneath its winter covering like the aching heart concealed in the grieving warrior’s breast, which strains at its enforced silence. But this is not only a personal but a universal sorrow, the fate of all human society, as if the future of the world could be summed up in one phrase: winter's coming. hrime bihrorene, hryðge þa ederas. the course of events changes the world under the heavens. So asks the pagan prince Saturn in The Dialogue of Solomon and Saturn, as he seeks answers from Solomon about the nature of the world; but the answer wise Solomon would have given to this question is lost (on a missing leaf in the manuscript). So we don't know. the frost’s fetters: God most mighty. 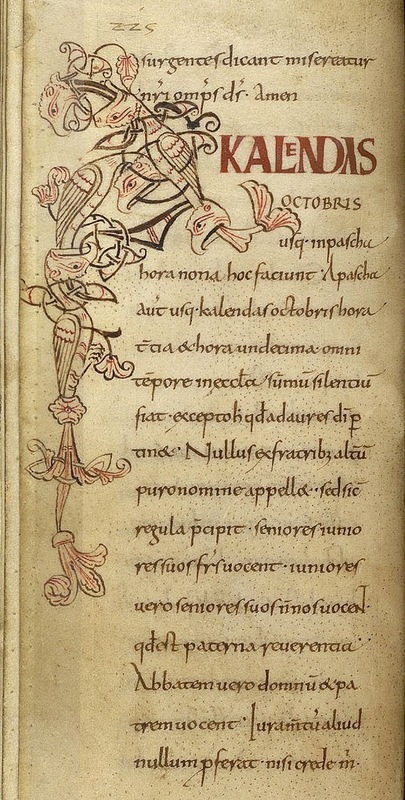 Wundor wearð on wege; wæter wearð to bane. There was a wonder on the waves: water turned to bone. Þyslic me is gesewen, þu cyning, þis andwearde lif manna on eorðan, to wiðmetenesse þære tide þe us uncuð is, swylc swa þu æt swæsendum sitte mid þinum ealdormannum 7 þegnum on wintertide, 7 sie fyr onælæd 7 þin heall gewyrmed, 7 hit rine 7 sniwe 7 styrme ute; cume an spearwa 7 hrædlice þæt hus þurhfleo, cume þurh oþre duru in, þurh oþre ut gewite. Hwæt he on þa tid, þe he inne bið, ne bið hrinen mid þy storme þæs wintres; ac þæt bið an eagan bryhtm 7 þæt læsste fæc, ac he sona of wintra on þone winter eft cymeð. Swa þonne þis monna lif to medmiclum fæce ætyweð; hwæt þær foregange, oððe hwæt þær æfterfylige, we ne cunnun. "O king, it seems to me that this present life of man on earth, in comparison to that time which is unknown to us, is as if you were sitting at a feast in the winter with your ealdormen and thegns, and a fire was kindled and the hall warmed, while it rained and snowed and stormed outside. A sparrow came in, and swiftly flew through the hall; it came in at one door, and went out at the other. Now during the time when he is inside, he is not touched by the winter's storms; but that is the twinkling of an eye and the briefest of moments, and at once he comes again from winter into winter. In such a way the life of man appears for a brief moment; what comes before, and what will follow after, we do not know." Dark and cold the winter may be, but this vignette also conjures up one of its best features: feasting in good company, 'the fire kindled and the hall warmed, while it rained and stormed and snowed outside'. Something to look forward to in the 92 days ahead. This image is from BL Harley 5431 (f.38v), a copy of the Rule of St Benedict made in Canterbury at the end of the tenth century. St Benedict's Rule divides the monastic year into two seasons, summer and winter, which had their different timetables and schedules of prayer; winter began in November, and this section describes the schedule hiemis tempore 'in the time of winter'. Its big initial H is formed from spiky lines which always look to me like brambles, or like bare branches black against the winter sky. Lovely post - thank you! It annoys me that people insist on the winter solstice as the beginning of winter. Whatever the contemporary astronomical consensus might be, humans experience winter primarily as a climatological phenomenon. To the extent that we experience it as an astronomical event, the solstice is the beginning of winter's end, as the days thereafter begin lengthening once more. Where I live in central North Carolina in the United States, winter begins much nearer to our Thanksgiving holiday, in the last days of November. I am bookmarking your post to read again when the last leaf has turned brown, and the frost is frequenting the ground. In the serendipitous way of social media I came upon your fascinating post which I read as the daylight faded outside my window here in the north of Ireland. Thank you so much, especially for including modern English alongside the originals. I shall look forward to further posts. 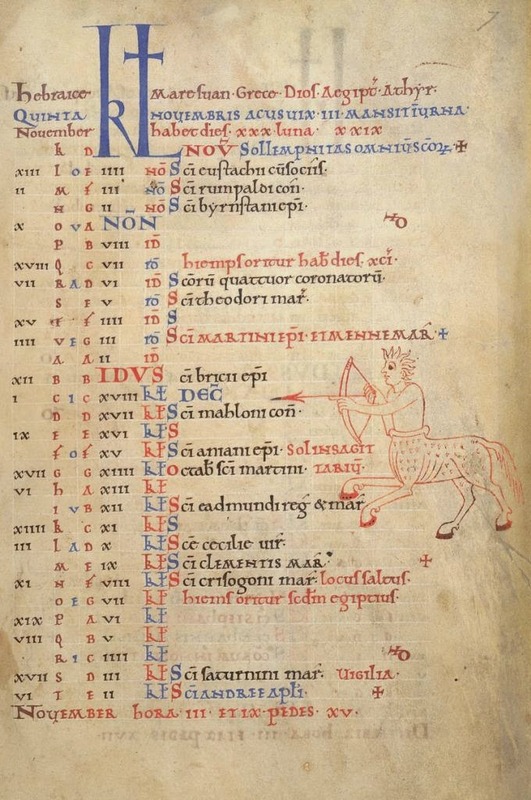 Is it worth pointing out that, due to to drift between the Julian and Gregorian calendars, the Saxons would have experienced the winter solstice on about December 15th? Yes, though in terms of counting the days it doesn't seem to make a difference - they considered the date of the solstice to be around the 21st-25th (Bede discusses different ideas about this in 'De Temporum Ratione', and concludes it should be 'a few days before the 25th'). A 92-day season would put midwinter around 22nd December. jerusalemtojericho, I agree! Psychologically the solstice just has to be the mid-point of winter, not its beginning. Lovely to hear from winter, or not quite winter, from as far afield as Ireland and North Carolina! I understand that St Lucy's Day was considered roughly the same day as the Winter Solstice, which would have been December 13 under the Julian Calendar. That was the case in later centuries, but, as I said above, in the early medieval period the solstice was widely considered to fall between 21st-25th December.